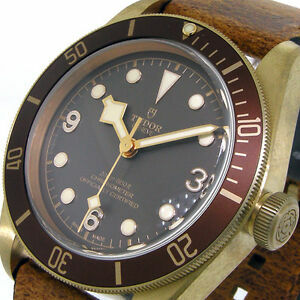 I have been a consistent owner of Tudor watches, and the Tudor Heritage Black Bay Bronze has a place withTudor's best. I am an owner of the Black Bay Black, and the Bronze takes it up a notch. The increase in size to 43 mm works well with this watch and it sits with a modern posture on the wrist. The case is very comfortable and I simply like looking at the lovely brown dial and interesting vintage features of the time piece. It carries Tudor's new in-house movement inside, the bezel has a perfect crisp rotation and even winding the watch after if has been sedentary for few days is a simple pleasure. The bronze case is both rugged and elegant and the subtle patina it naturally forms will individualize each piece uniquely. Built tough and meant to be used, the nice thing about a bronze case is that the occasional scratch, or scuff with wear really enhances the look of this watch as opposed to scratching a polished steel case. The Black Bay Bronze with its simple time-ony function and classical dive-watch features, fits in with my style which includes Panerai, and other tool watches from the past. The Bronze is a simple time-only piece and sometimes I wish it had a date function which would certainly make it more of daily-wear watch for me. The distressed brown strap is very well made, but small for larger wrists, and the military styled NATO is a perfect match. With drilled lugs, strap change is a breeze, and I have placed some custom Ammo and 74 straps on this piece changing the look and style. Overall I am very pleased with the Tudor Heritage Black Bay Bronze. They are hard to locate now for a reason. A watch destined to become a classic in years to come. finally a bronze watch with some class. nice size, very comfortable to wear.